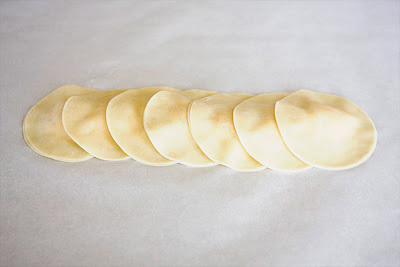 one of my favorite tricks to get a fresh pasta taste, but with no work, is using wonton skin wrappers for ravioli. you can create a meal in no time that looks like it took you all day long. 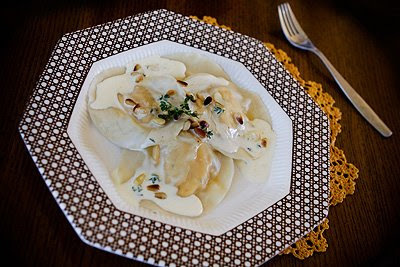 in season butternut squash is a perfect addition to ravioli, and the taste is amazing. 2. brush olive oil over the cut sides of the squash, then sprinkle with salt + pepper and place cut side down on a cookie sheet. place garlic with a drizzle of olive oil and salt + pepper in aluminium foil and place on cookie sheet. 3. bake squash and garlic for one hour. remove from oven and let cool on rack. 4. after cooling, scoop the squash from the skins. measure out 1 1/2 cups of squash in a medium bowl. remove garlic from skins and mash up in bowl. 5. add remaining ingredients to bowl except wonton skins and mix well. 6. place wonton skin on clean surface and dip finger in a small bowl of water and line the edges with a small amount of water. 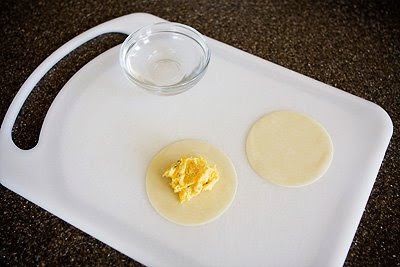 7. place a small teaspoon full of filling in middle of wonton skin. 8. place another wonton skin on top and press down edges. 9. repeat until all filling and wonton skins are used. 10. meanwhile, in a large pot, boil water with 1 tablespoon olive oil, and a little salt. 11. in batches boil ravioli for only 1 to 1 1/2 minutes. it will cook very quick. remove with a slotted spoon. place first 4 ingredients in a sauce pan on medium-high for about 5 minutes until it thickens and bubbles a little. remove from heat and add pine-nuts. serve sauce over ravioli. I just want to say that I love your blog!! I love to see all of the great things you cook and how crafty you are. How do you make time for it all? I am a stay at home mom of one beautiful baby girl and it seems like sometimes I cant even manage to get in a shower let alone bake and blog. How do you do it? By the way where do you get or how do you make your cute little tabs that go on all of your canning bottles? It makes them look so professional. This looks so yummy!!! I am insanely hungry now. I am gonna print and give the recipe to my bf to make for dinner this weekend!! wow, this looks and sounds devine! it looks really great! i’ve never made my own ravioli before. love the garnishes. Hi its me again. Thank you for getting back to me. I was just wondering where you get or how you make the labels that you put on all of your bottles you can?? Yum. Those sound SO good. Pop on over to my blog, I’ve nominated you for a little award! 🙂 Well, wait 5 min, it’s not up just yet..